Today marks the second anniversary of Hurricane Sandy. To commemorate, the Housing and Community Development Network of New Jersey joined Sandy survivors, community leaders, and elected officials at several events along the Jersey Shore. Rooflines contributors, leaders and practitioners in the field of housing, community, and economic development have shared stories of strength, struggle, and outrage in Sandy's aftermath. 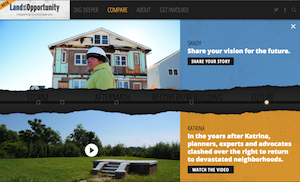 Instead of words, today we share Katrina/Sandy, an interactive video produced by Land of Opportunity and Sandy Storyline that compares and contrasts both the impact and response to Hurricanes Katrina and Sandy, through storytelling.